The Paradise Ridge Defense Coalition (PRDC) invites its supporters and members of PRDC affiliated, environmental groups (Palouse Broadband of the Great Old Broads for Wilderness, Palouse Environmental Sustainability Coalition, Palouse Group of the Sierra Club, and Wild Idaho Rising Tide) to attend the PRDC Annual Membership Meeting on Wednesday, May 2, at the Yellow House next to the Unitarian Universalist Church of the Palouse, 420 East Second Street (near the 1912 Center and Van Buren Street) in Moscow, Idaho. Please come to this casual event anytime between 5 and 7 pm, to talk with PRDC board members Cass Davis, Steve Flint, David Hall, Al Poplawsky, Pat Rathmann, Mary and Steve Ullrich, and Helen Yost, ask questions, vote for board candidates, enjoy hors d’oeuvres and drinks, and pay $5 annual dues. If you cannot participate, please send donations and dues to this 501(c)(3) non-profit organization, via mail to P.O. Box 8804, Moscow, ID 83843, to assist its lawsuit efforts to protect native Palouse prairie remnants from U.S. Highway 95 expansion onto Paradise Ridge, and to “ensure and enhance the public safety, environmental integrity, and natural aesthetics of Paradise Ridge and its environs” (PRDC mission statement). Invite your friends and families, and join the regional, climate activist community, #No2ndBridge group members, and WIRT organizers for the May, first-Wednesday, monthly, WIRT gathering at The Attic, up the back stairs of 314 East Second Street in Moscow, Idaho, at 7 pm on Wednesday, May 2. Discussions and action plans include Farmers Market outreach in Moscow and Sandpoint, an oil and gas waste injection well protest and petition presentation in Boise, and ongoing, dirty energy transportation monitoring and reporting. We especially need your participation in work on a #No2ndBridge petition, brochures, banners, a peaceful, public, Sandpoint protest, regional attendance and expert testimony at May 23 hearings and rallies with speakers in Ponderay and Sandpoint, and a summer, direct action training camp, all opposing Burlington Northern Santa Fe Railway track and bridge expansion of the coal, oil, hazmat, and possibly tar sands pipeline-on-wheels across Lake Pend Oreille and north Idaho. 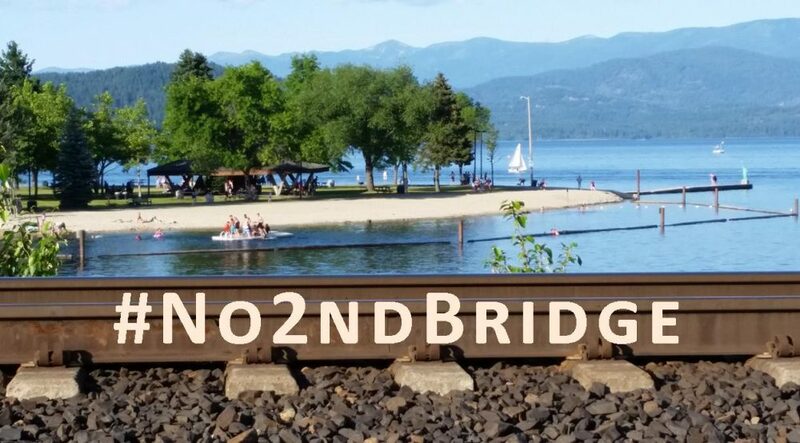 At this WIRT convergence, we are starting to present #No2ndBridge information sessions with slide shows in Moscow, Sandpoint, Missoula, Spokane, and other, inland Northwest locations. All are welcome to bring their creative ideas and energies and potluck food and beverages, to share current, issue updates and background, and to explore strategies and tactics in support and solidarity with grassroots, Northwest resistance to the power and pollution of the fossil fuel and railroad industries. Contact WIRT via email or phone, with your questions and suggestions about potential meeting topics and activities, and to coordinate overlapping campaigns and upcoming events among allies. 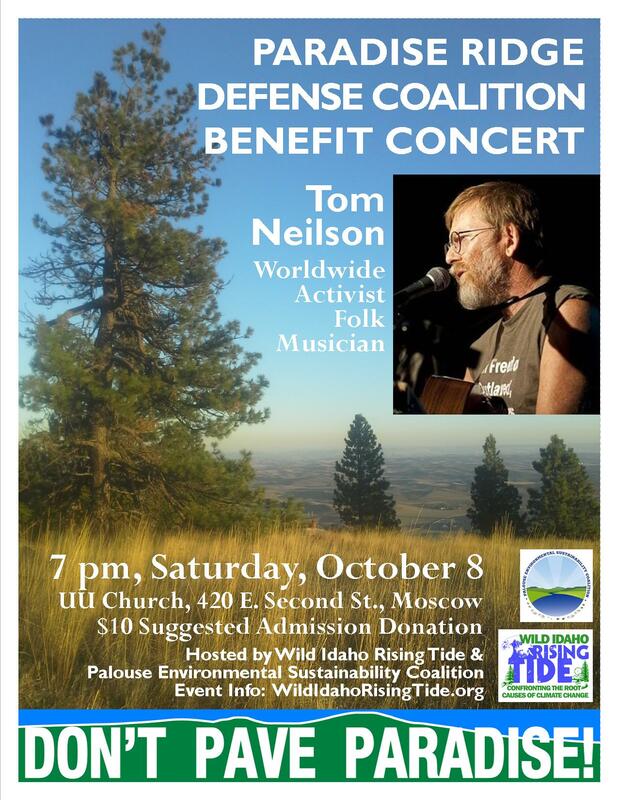 Several north Idaho groups are co-hosting the Paradise Ridge Defense Coalition Benefit Concert, offered by singer-songwriter and long-time activist Tom Neilson, in Moscow on Saturday, October 8. Dubbed the Jon Stewart of folk music, Tom offers inspiration through his music to effect change . He has performed his award-winning songs of humor and compassion in 21 countries on five continents. His songs about historical and current events reflect his travels, intertwined with his farm roots and his fervent commitment to social justice. Audiences celebrate Tom’s lyrics for their political astuteness, sophistication, and wit. Concert co-sponsors Palouse Environmental Sustainability Coalition (PESC) and Wild Idaho Rising Tide (WIRT) gratefully welcome everyone to participate in this community event providing a gathering place for people supporting the legal expenses of the Paradise Ridge Defense Coalition (PRDC), of which PESC and WIRT are grassroots, allied, member organizations. On August 18, PRDC filed a legal complaint against the Idaho Transportation Department (ITD) and the Federal Highway Administration in U.S. District Court for Idaho, challenging their environmental impact statement and record of decision issued for reconstructing, relocating, and expanding 6.5 miles of U.S. Highway 95 immediately south of Moscow [2-6]. Protecting nearby Paradise Ridge from inappropriate highway realignment since 2003, PRDC is disputing these agencies’ studies and selection of E-2, the easternmost of three proposed Highway 95 routes. ITD’s stubborn commitment to building the controversial E-2 route over the shoulder of Paradise Ridge threatens some of the best remnants of the estimated less than one percent of remaining, native, Palouse Prairie vegetation with weed invasion, wetland and prime farmland destruction, and wildlife habitat reduction. The higher, 2,800- to 3,000-foot elevation of E-2 would subject highway travelers to more accidents during inclement and winter weather conditions, when 57 percent of mishaps on the current highway section occur, and would also risk more big game collisions closer to their habitat. For this Saturday, October 8 opportunity for the Moscow-Pullman and greater Palouse community to support PRDC, the doors open at 6:30 pm at the Unitarian Universalist Church of the Palouse, 420 East Second Street in Moscow, Idaho. Activist musician Tom Neilson begins his performance at 7 pm, for $10 suggested admission donations. See the enclosed descriptions of Tom Neilson’s background and Paradise Ridge Defense Coalition concerns, and peruse the websites and facebook pages of Tom, PRDC, PESC, and WIRT, for further information about these endeavors [1-5]. A group of citizens has filed another lawsuit against the Idaho Transportation Department for its project that aims to realign and expand part of U.S. Highway 95. The Paradise Ridge Defense Coalition alleges the transportation department produced a “deeply flawed” environmental impact statement that downplays or ignores the environmental repercussions of construction planned from Moscow to Thorn Creek Road, according to a 23-page lawsuit filed in the U.S. District Court of Idaho. The lawsuit calls for the withdrawal of the statement and an order prohibiting the project from being implemented. Steve Flint, a board member for the nonprofit, said the group’s concerns have not been quelled since members last took legal action against the state in 2003. “One of the biggest concerns is that the eastern route that they proposed is closest to the prairie remnants,” he said. In March, the Idaho Transportation Board unanimously approved the eastern route alternative for the 6.34-mile stretch of highway, and the formal record of decision was published in April in the Federal Register. The project will expand the highway from two to four lanes, including a 34-foot median and center turn lanes, as well as curbs, gutters and sidewalks at the northern end of the project, just south of Moscow. The eastern alignment, one of three options considered, is nearest to Paradise Ridge. The area contains some of the last remnants of the Palouse Prairie, Flint said, including the endangered Spalding’s catchfly. The lawsuit argues environmental damages caused by the eastern route, along with mitigation efforts, have not been adequately analyzed. The Paradise Ridge Defense Coalition filed a legal complaint Thursday against the Idaho Transportation Department and the Federal Highway Administration in the Central Division of U.S. District Court for Idaho over their plans for widening U.S. Highway 95 south of Moscow. According to a news release from the Paradise Ridge Defense Coalition, the 23-page complaint challenges the Environmental Impact Statement and Record of Decision issued for realigning 6.5 miles of the highway from Moscow to Thorncreek Road over Paradise Ridge. The FHA signed the formal Record of Decision on March 21 authorizing ITD to purchase land and begin construction of the project as early as the fall of 2017. The FHA and the ITD evaluated other alternatives for highway realignment, including western, central and eastern routes, before choosing the easternmost route after years of an environmental review process, according to information on ITD’s website. PRDC has said the proposed route would lead to loss of wetlands, remnants of Palouse Prairie, farmland and conservation reserve; and the removal of acres of pine stands and related habitat. It also would cause more noise, have a wider visual effect and it is not the safest route for travel because it is at a higher elevation than other routes and is used by large game for crossing. In spite of years-long efforts to persuade transportation officials not to realign U.S. Highway 95 from Moscow to Thorncreek Road over Paradise Ridge and through an untouched area of the Palouse Prairie, the federal Record of Decision was signed this week verifying the choice to do just that. “It’s a great day for the public,” said Ken Helm, project manager for the Idaho Transportation Department. The Idaho Transportation Board gave the project design approval today and ITD expects the filing in the National Register of the project’s 150-day statute of limitations to occur next week, Helm said. “It’s kind of what we expected,” Steve Flint, one of the board members of the Palouse Ridge Defense Coalition, said about what the group considers a disappointing choice. In 2003, the coalition and other groups successfully argued the ITD failed to adequately examine the environmental effects of its plans for U.S. Highway 95, and a judge ordered a full environmental impact statement process be completed. Last year, the group announced it was willing to take legal action based on the latest project documents, specifically the FEIS, if they appeared inadequate. Help Stop ITD Paving Paradise by Monday! 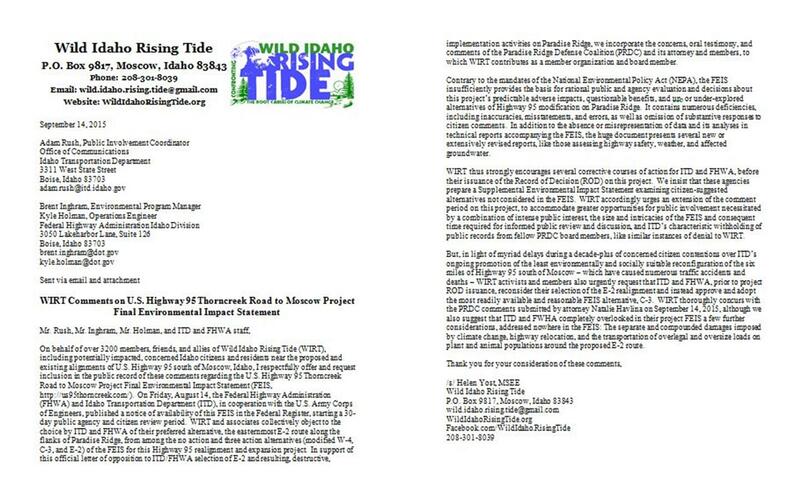 Please excuse the lateness of this message, but Wild Idaho Rising Tide (WIRT) could not miss this chance to alert you to the opportunity to comment on and support resistance to the final environmental impact statement (FEIS) on the U.S. Highway 95 Thorncreek Road to Moscow project. On Friday, August 14, the Federal Highway Administration (FHWA) and Idaho Transportation Department (ITD), in cooperation with the U.S. Army Corps of Engineers, published a notice of availability of the FEIS for the Highway 95 realignment and expansion project in the Federal Register, starting a 30-day public (citizen and agency) review period. After myriad delays during a decade of concerned citizen contentions and “intense review and study,” ITD and FHWA have again indicated their preference for the easternmost route, E-2 along the flanks of Paradise Ridge, from among the no action and three action alternatives (modified W-4, C-3, and E-2) of the FEIS. The Paradise Ridge Defense Coalition (PRDC), to which WIRT contributes as a member organization and board member, received this news from its attorney a few days before FEIS release. The huge document, accessible electronically on an ITD website and available for public viewing through printed paper copies at various locations like libraries, city halls, and chambers of commerce, offers corrections to the January 2013 draft environmental impact statement (DEIS) and thousands of pages of combined public comments on the DEIS, ITD responses, appendices, and technical reports (some presenting new information). Its size alone, not to mention its numerous shortcomings, warrant an extension of time to review its analyses of project effects on natural and human environments. Nonetheless, PRDC board members and their lawyer have been urgently scrutinizing the FEIS, applying their greatly appreciated, collective expertise, diligence, and doggedness, to identify and develop legally defensible arguments refuting multiple aspects of the FEIS. They have recently held a special and regular monthly meeting, and intend to submit final comments before the September 14, 2015 deadline. At an unknown time after the 30-day review period, FHWA will issue a record of decision (ROD) for the highway improvement project purportedly improving the safety and capacity of the 6.3-mile segment of U.S. 95 between mileposts 338 and 344 – Thorn Creek Road to the South Fork Palouse River Bridge in Latah County, Idaho. PRDC and WIRT will send updates on the situation and opportunities for your involvement, as PRDC and its lawyer review the FEIS and consider as quickly as possible potential litigation and supporting actions such as membership meetings and recruitment of impacted residents, fundraising events and mechanisms to cover legal costs, and effective public protests. 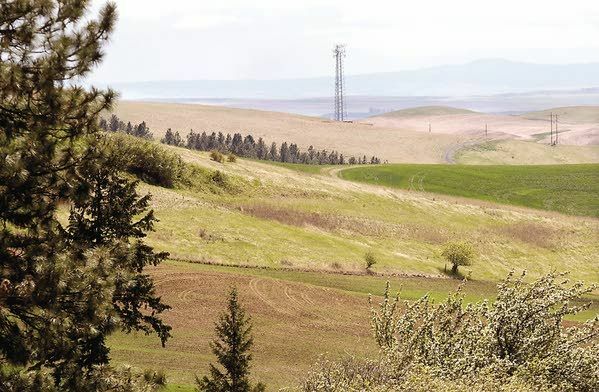 If built on the eastern route referred to as E-2, a new section of U.S. Highway 95 would start near this cell tower, travel north through a grove of trees, and continue across this grassland (Geoff Crimmins /Moscow-Pullman Daily News photo). The scene to the west of U.S. Highway 95 – and its three proposed realignment route choices – is breathtaking from Paradise Ridge, with rolling green meadows and the occasional picturesque structure in spacious rural settings. The existing highway is off in the distance and only takes up a small section of the view as cars and trucks appear to be rolling specks. 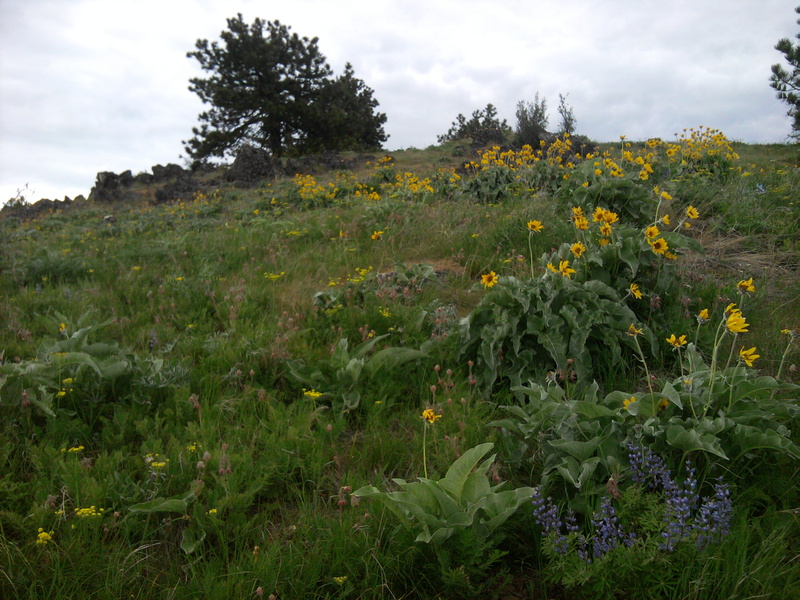 But look down at the knoll underfoot and prairie flowers – iris, camas, lupine, groundsel, lomatium, prairie smoke and arrow leaf balsamroot within other native plants, invasive weeds and planted grass – pop up here and there. Thin, long deer trails also run through the grass. Steve and Mary Ullrich, both members of the Paradise Ridge Defense Coalition, live nearby the section of the ridge, where they marked a site with a long line of red balloons stretching about 600 feet. The section is one where plenty of animals roam and some ponds are on the far side of the balloons. The balloons marked the approximate width and location where the highway realignment preferred by the Idaho Department of Transportation would run. ITD refers to it as E-2. That plan and the other two options, C-3 and W-4, will improve 6 1/2 miles of the highway running south from Moscow to Thorncreek Road. About 50 people attending the annual meeting of the Paradise Ridge Defense Coalition on Thursday night focused on how to stop the Idaho Transportation Department from carrying out its preferred plan to realign and widen U.S. Highway 95 south of Moscow to Thorncreek Road. Several key members of the coalition set up displays in a meeting room of the Unitarian Universalist Church of the Palouse in Moscow, and fielded questions about topics such as recreation, area history, and numerous environmental characteristics of the location.